Having visitors drop by over the summer months can be tricky. You want to show them the best Dubai has to offer, but trekking through sand dunes or spending a day at one of the city’s great beaches just isn’t as pleasant in August (especially for those not used to the Dubai heat). An absolute classic thing we love to take visitors to is the Al Hadheerah Desert Restaurant at Bab Al Shams – with its live cooking stations (the grills are excellent), fun entertainment, mounds of mezze and views of rolling sand dunes, it’s a quintessentially Dubai experience. Thankfully, your visitors can still experience it this month, as a huge air-conditioned tent has been erected over Al Hadheerah that means you can feel away from it all (and see the dunes) without being overwhelmed by the heat. 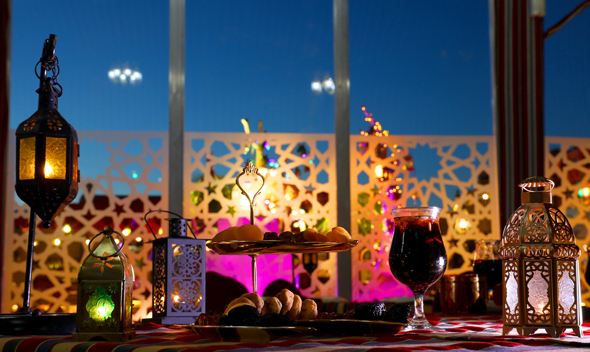 Al Hadheerah is now inside an air-conditioned tent to keep you cool over summer. 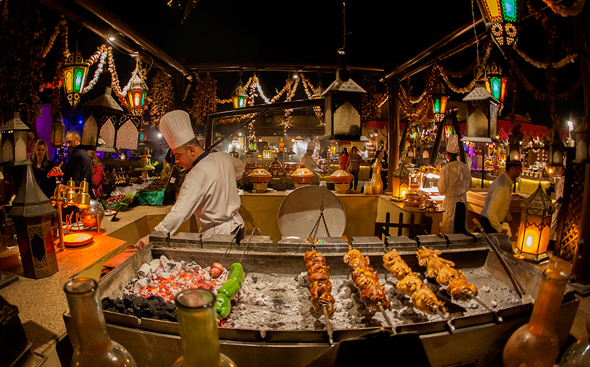 The restaurant is modelled on an old Arabian fort, and features many live cooking stations, as well as low-slung, traditional style seating. There’s even a traditional whole-lamb ouzi to sample. The entire restaurant has been covered by the purpose-built glass air-conditioned tent for the summer, and just next door you’ll find the heritage village where you’ll get to experience camel rides, henna painting and more. The grills at Al Hadeerah are a definite highlight. Throughout the dinner you’ll get to see an Arabic singer, a tanoura dancer, a horse show and a camel caravan (the latter is our favourite). It’s basically a super-fun night out and a bit of a Dubai bucket list item that everyone should try. And the best bit is that for the rest of August it’s just Dhs275 per person for all you can eat and the entertainment. And children under 12 dine free. Book the summer deal here. The dinners run daily from 7.30pm to 11.30pm, Bab Al Shams Desert Resort & Spa, Al Qudra Road, Dubai. Tel: (04) 809 6194. More info on website.